OCCC recently released its $60.5 million Educational and General operating budget for fiscal year 2014, outlining the sources of funds that make it possible for the college to operate. The overall E&G budget is down slightly from FY 13. The total estimated E&G budget has gone from about $63.1 million last year to $60.5 million for the upcoming year. Vice President for Business and Finance John Boyd said this is due to a reduction in the carryover and reserve funds. 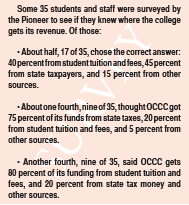 The official OCCC budget book shows that 43 percent of the E&G budget comes from the state, while 37 percent comes from student tuition and fees, and another 2.6 percent comes from prior year student fee collections. Boyd said many believe state funding pays for the majority of the school’s operating costs. However, he said, those folks aren’t taking into consideration that the state has lowered the amount of funding for higher education. Boyd said OCCC currently receives less state funding than it did in 2008. “State funding, as a component [of operating costs], has declined,” he said. Boyd attributes the gradual decrease to the current state Legislature. “Higher education is perceived as being overfunded,” he said. Although state tax revenue rose by half a million dollars for FY 14, compared to last year, that piece of the pie makes up a smaller share of OCCC’s overall E&G budget than in times past. And, Boyd said, the next largest source of funding — tuition and fees — is expected to go down. That projection is based on an expected decrease in enrollment. Boyd said a slight drop in enrollment in FY 13 didn’t drastically affect the E&G budget last year, but he sees the trend continuing. Boyd said the current system for state funding is largely performance based and the amount of funding OCCC receives as an institution of higher education has a great deal to do with student aptitude as well as how many degrees are being awarded each year. Revenue from other sources has decreased as well. Unexpected expenses contributed to this, Boyd said. He said about $1 million of unanticipated expenditures were spent to repair damage that OCCC incurred during the May 31 tornado that hit the south side of Oklahoma City. Other unexpected costs, like a chiller repair that cost around $300,000, also affected the budget overall. This reduced the “Projected Carryover and Reserves” category to $4.3 million in FY 14, compared to $6.9 million in FY 13. Carryover and reserve funds make up about 7 percent of the total budget and fall into the “other” category. Of OCCC’s “other” sources of funding that make up about 15 percent of the total E&G budget, about $5 million can be attributed to the South Oklahoma City School District, Boyd said. He said money collected from the school district comes from ad valorem taxes, or taxes that are paid based on the value of real estate. These ad valorem taxes are what OCCC collects from the South Oklahoma City School District for “technical education reimbursement,” according to the budget book. They are the biggest part of the 15 percent of “other sources” covering OCCC’s operating costs. And, he said, despite the tuition increase, OCCC still has one of the lowest tuition rates of Oklahoma higher education institutions. However, he said, it also is one of the lowest-funded of all state institutions when looking at state revenues. In addition, he said, as state funding has declined, inflation has increased operating costs. “The prices that we have to pay as a college have gone up,” Boyd said. He said inflation has affected the operating costs of the school just as it has affected the consumer market.